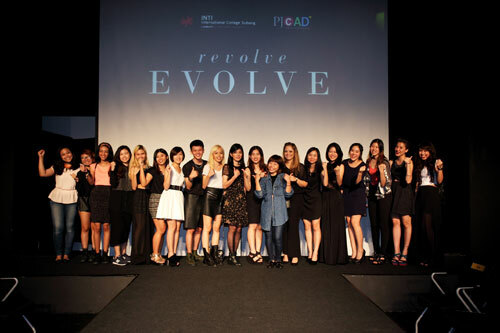 Evolve.Revolve – an embodiment of discovery, creativity and imagination, and the theme for the event – was apparent in the 6-piece designs by 18 students. Fine crafting and designing of delicate patterns and styles within layers of fabric, colors, textures and embellishments by the students provided a beautiful juxtapose of aged ideas and modern approaches in defining form and function. Adding a Midas touch to their final works were lace, beads and trimmings of all sorts inspired by a rich reference to different genres and styles. While the romantic past seemed to lay claim to the silhouettes displayed, modernity blossomed among the layers of composition. Guided by a dedicated team of highly qualified and experienced fashion instructors, INTI’s young graduates are part of a new generation of trend setters and designers in the fashion industry. Their international exposure, innovative learning and individual development are enhanced through participation in many competitions, industry projects, international study trips and practical training with established local and foreign labels. They are known for their award winning works at many significant international and local events such as MODA, Miss Astro Chinese International Pageant 2013, STYLO, Fahrenheit 88, KL Fashion Week 2013, Zouk 2013 Anniversary, and L’Aperitif Kronounberg 2013. Following the introduction of the Diploma in Fashion Design at PJ College of Art & Design in 2008, its graduates have bagged numerous coveted awards in the local and international fashion scene. Their trail-blazing concepts have stimulated competitiveness in the industry, and won the hearts of fashion icons and personalities worldwide. Today, as PJ College of Art & Design is integrated with INTI Center for Art and Design (ICAD), the graduates and alumni of years past and of the future will continue to create landmark achievements under the stewardship of the new faculty, ICAD, at INTI International College Subang Jaya. “Our students have the opportunity to expand their educational experiences by studying in local and foreign environments. This exposes them to a variety of ideas and ways of thinking, developing them as designers with international perspectives – an advantage in the global employment market. Many graduates take up the opportunity to work and make their mark abroad for a period before returning to achieve greater things in their home country,” said Anis Laila Yap, Dean, INTI Centre of Art & Design.